Cottage # 11 is a beautiful 3 bedroom cottage featuring 2 queen beds and bunk bed with double futon and twin bed on top, large kitchen and dining area, TV, DVD player, satellite service, 3 piece bath with shower, large screened in porch, big deck with patio set, outdoor fire place and a big yard. This cottage is located close to all amenities. For the comfort of our guests please limit your group to the number specified for each cottage. If you wish to bring an extra person, there will be an additional charge of: $65 per day or night, $200 per week for adults and children. To avoid overcrowding for our paying guests, all day visitors, relatives, friends and guests will be charged $50 per person per day or part day. Please register your guest at the store/office before their arrival to avoid the charges being applied to your account. 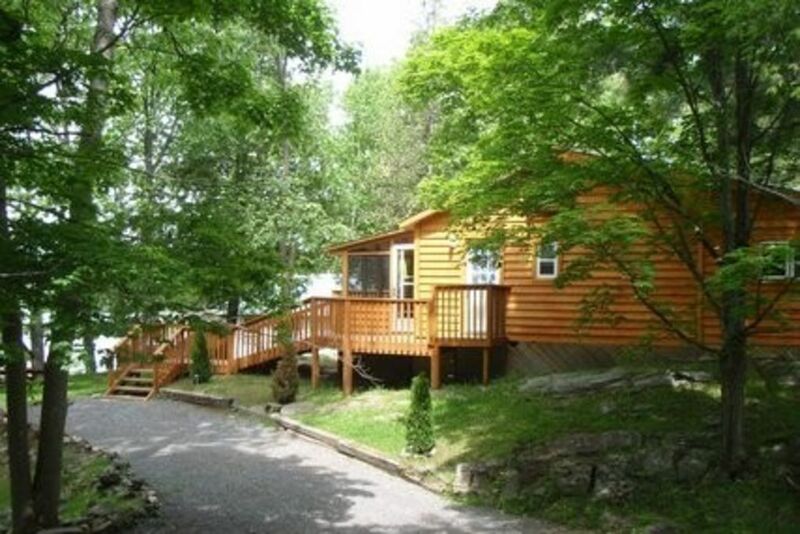 $200 not refundable deposit must be submitted as to secure your cottage reservation. $300.00 not refundable deposit must be submitted as to secure the Luxury Main House or Log Cabin reservation. Your authorization to use your credit card number for your rental deposit or security deposit indicates your compliance with our booking terms and conditions. Rates vary, please contact us for detailed rate information. Extra person fee of 65 per person per night after the first 6 guests.